I bought a small bag of malachite chips to grind into pigment, to go into the William/Isolde scribal gift box. As I was having fun smashing it, it occurred to me that we do have greenish pigments, and I wondered if malachite might not compose one. So, I smashed it and smashed it until I got cramping fingers and crossed eyes (Actually, not that long or difficult). I got out my handy 325 mesh sifter, as in theory that's the level Reusche grinds to, and sifted the malachite until I had a handy stash in an old spice bottle. Because I am for scientific experimentation, I wanted to control everything except one variable. I used some Reusche clear glaze base so I could see what the malachite would do on it's own. 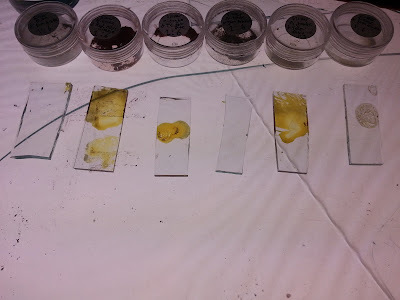 I realize, I don't know the ratio of glass (or glass components) to oxides in pigments; One period text would say 2 parts glass to one part copper. I made four test chips to compare different ratios, 1:1 through 1:4. I mixed them on an ad hoc glass palette with a muller. The muller, being glass, seemed the easiest to clean. 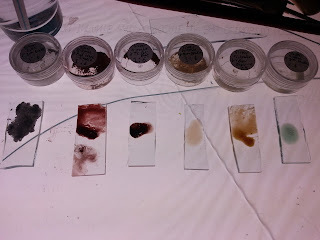 I noticed how easily the pigment mixed, much like working with commercial (Reusche, Fusemaster, etc) paints and stains. The very fine mesh size seems to promote fluidity. I used a bit more water than I would for "real" but with this small quantity of paint it was rather difficult to get the right water content (I guess I could have tried to drip it off an eyelash or a cat's whisker, but neither myself nor Zod were willing to cooperate with that). The water won't change the performance of the paint, only how it handles on the brush, so having too much water shouldn't impact the results. I weighed them on my mini digital scale to get the ratios. Although it does .1g increments, the floor seems to be .2 grams. That was what I used as a "unit", so the 1:1 chip is .2 grams of malachite to .2 grams of clear base. 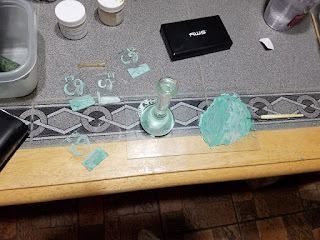 The 1:4 is .2 grams of clear base, and .8 grams of malachite. I wrote my name on the chips, for some reason the first thing that entered my head, to test the line work. I then smeared paint on the bottom block of each chip to show various values. I also marked the ratio at the top. 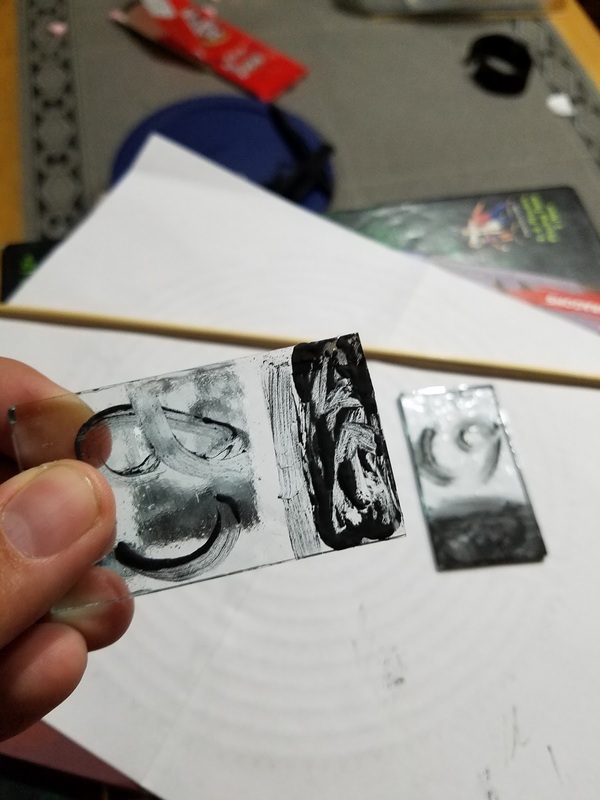 I first picked up the 1:4 chip, and immediately noticed the paint flaking off onto my fingers. My fingertips were tinged grey/black/blue. 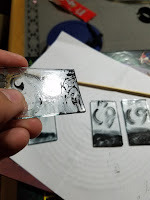 I found, using a wooden skewer, that the 1:3 chip was also very easy to scratch paint from. The 1:2 I could leave some trace, but not much. The 1:1 completely resisted the stick like Reusche paints would. 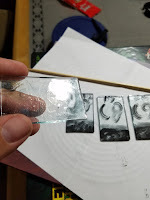 Looking at the reflected light, the 1:1 chip also looked much like a dozen other test chips I've made; the paint is completely glassy and adhered to the test chip. I fire my vitreous paints to the high end for that effect, so this is expected. 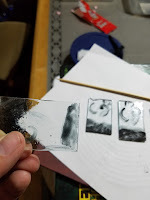 The other three showed a rough, grainy texture I associate with previous experiments that had too rough an oxide. 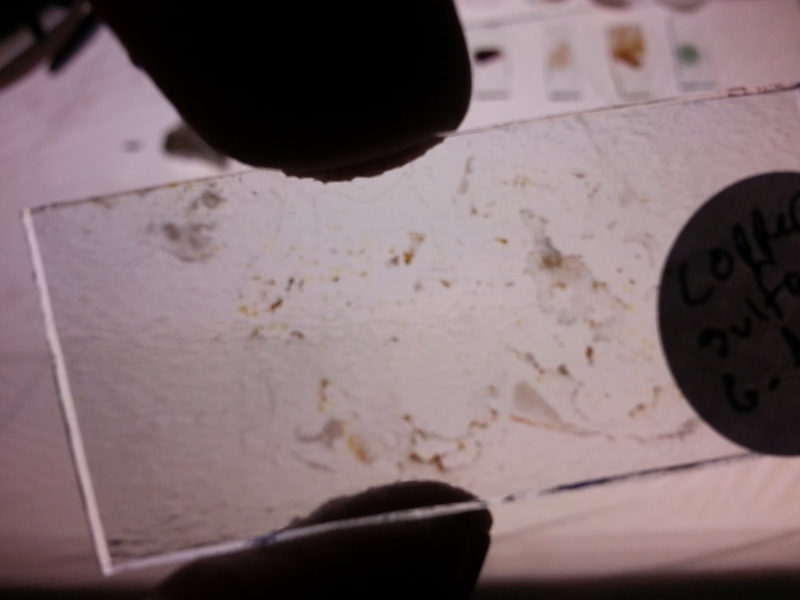 Yes, a randomly selected mineral MIGHT make a usable vitreous paint! Something near a 1:1 ratio is probably idea to bind the pigment to the glass, though 1:2 was also serviceable. My tests of the period formulas are 1:2, and were very similar. It would be wonderful to find out what actually goes into Clear Glaze. My normal secret trick is to check the EU vendors, who seem to list MSDS's that US vendors do not. Unfortunately Peli doesn't include one for Clear Glaze. Reusche gives them out if you make a special request in writing, whereas Peli just has them on their website. I rather suspect this is because the MSDS sheets rather give away the secrets. 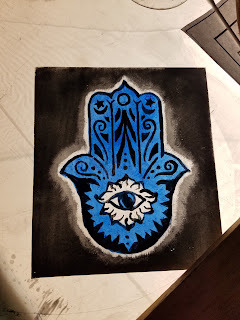 I had the idea to make a Hamsa. The idea persisted, and turned into a large flop. So, I remade it. Which turned into a second flop. 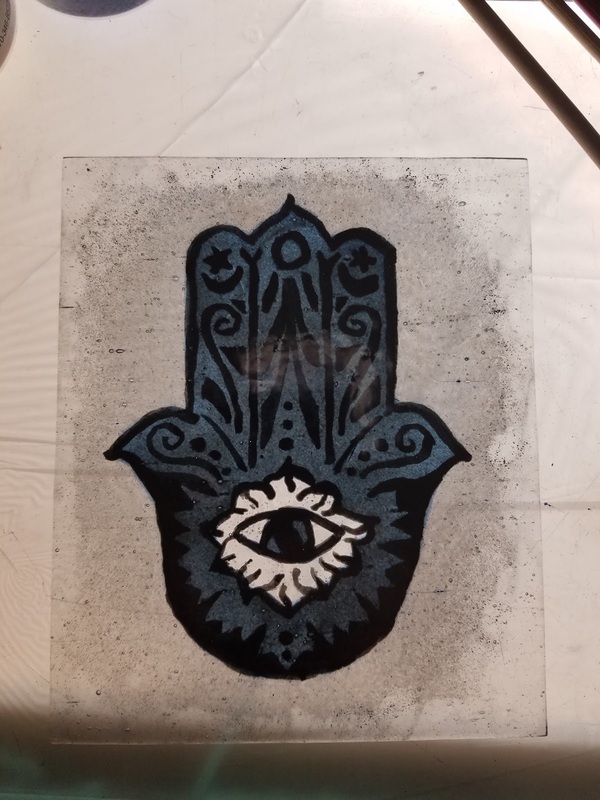 I ended up making nearly the same design, but pieced. I was mad and determined, at that point. 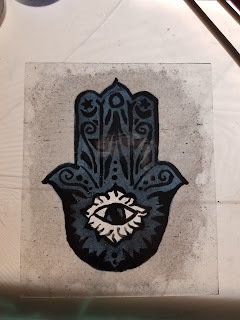 I started with a design I found online; I found it on several websites, in several ways and places. 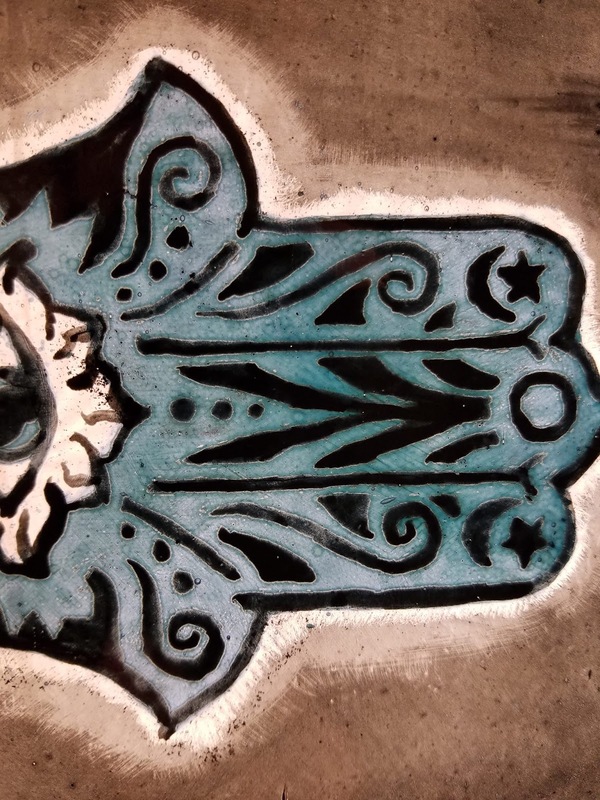 I couldn't determine an original creator, etc and chalked it up to a generic cultural motif. Having learned much from Estelle's scroll, I thought I planned it well. 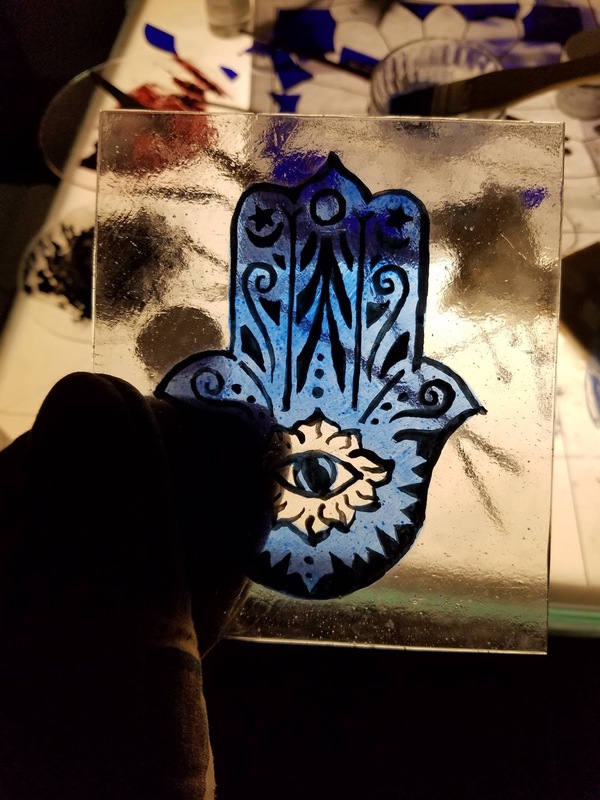 I used the more stable blue, and skipped the idea of using silver stain. Attempt 1, I painted on the black line work, then added a mat of blue enamel. In the past, again for one of Estelle's badges, I got a phenomenal sapphire blue right off the bat. That gave me incorrect assumptions about how easy it can be to use! This happened over a year ago, and Facebook isn't helping me work out the order. I know at one point I discovered I had two different blues on hand, with no recollection of the opaque one. So much so that I went back and found the order and made sure I had consciously ordered it (which I had). 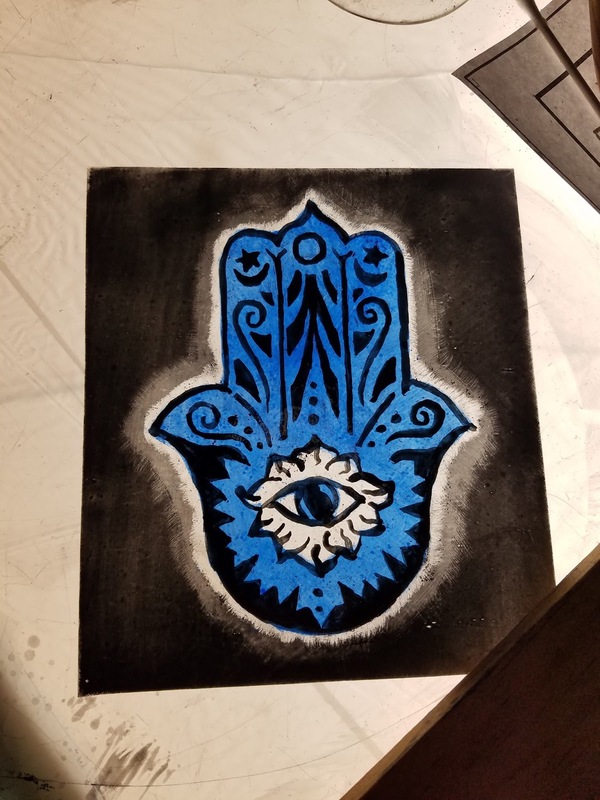 The next piece, I kept adding blue trying to get the Sapphire hue I wanted. After a few coats the enamel turned opaque and off-color, a grayish tone to it. I still don't know why, but I decided I needed to get it right from the start. The next attempt, after doing the line work and the enamel I decided I wanted to shade the background and went back, to add more black mat. That tanked the whole piece as well, as shown below. Ugly and wrong color, above! My "mistake" in going back to vitreous paint. Guess blue enamel isn't as stable as I thought. A closeup of the weirdness that ensued. 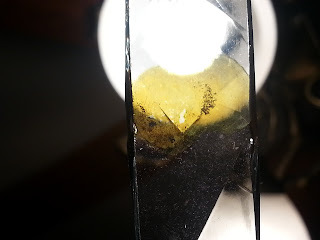 I suppose too many layers of enamel flattened out and blurred the black lines beneath, like layers of glass can displace one another when fusing. 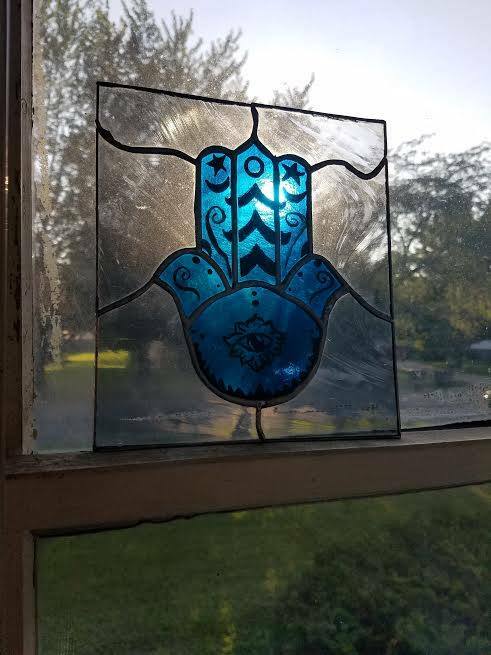 The final piece I successfully made and framed, to get a Hamsa out of my mind. 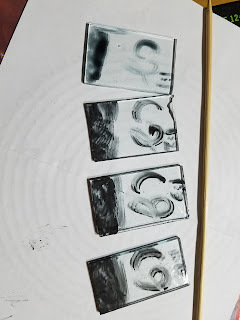 I've not included a picture of the pattern to retain my blog's G-rating, as each piece was named with a different profanity, instead of the customary numbers or symbols. The bottom right corner was 'bullsh*t' if I recall. It was easy to cut, that was just it's nickname. 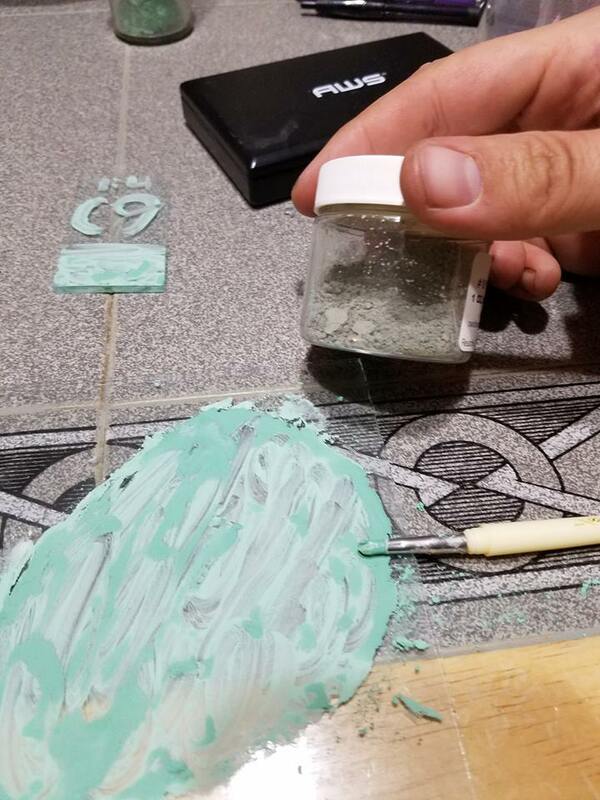 Be sure you are using the glass paint you think you are using! Blue enamels are also touchy. All enamels are semi-evil. It looks like many layers can displace one another between firings. Rhode Kephalaina let me know in her sample chips, marked 1 and 2, thats the sheets of foil. So, chip '1' has four layers approximately, and '2' with 8. My samples above are 4" square, not 1", and had one layer. It's not exactly ugly! It's just not the beautiful gold glass expected. 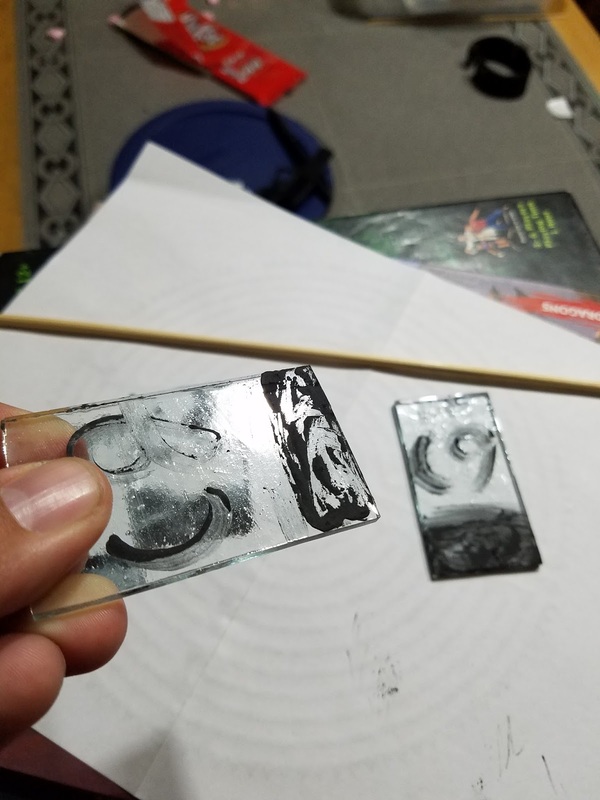 The nicer parts of mine are where the foil doubled on itself (see Lessons learned, below...) I know now to fix it, though, thanks to a conversation with Rhode. Ive also fallen for verre églomisé. Predating Rome, pretty much, this art (gilding glass and painting the back black) was practiced through the Roman period into modernity. It gets its name from an art collector 200 years named Glomy. It turns out it's not super difficult! Sorry it's sideways. 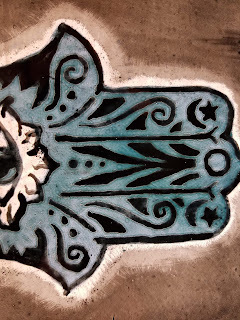 I can't quite remember how the technique entered my awareness, either through researching mosaics or mirroring. 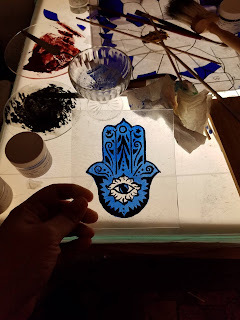 A little gelatin, some gold leaf, and some glass. A fine needle to scratch it up, and black paint. I'm going to teach a class on it at Pennsic this summer, which is exciting to me. I've tried a few types of leaf, a few tools to transfer it to the size, and will be picking up a second (larger) gilder's tip this week. It's beautiful to look at and I'm excited to see how I can integrate it into stained glass and mosaic work. Transfer foil is a lot better to work with for verre églomisé. Tiny creases are almost unavoidable with loose leaf, but the gelatin size flattens them out as it dries. The end result isn't perfect but it is much better than what you start with. TURN OFF YOUR CEILING FAN. Many people remark that gilding can be done at your kitchen table, and they are quite right. But when you bought a book of loose gold leaf and have the fan on medium, you are going to make a kaleidoscope of tears and gold for a moment. 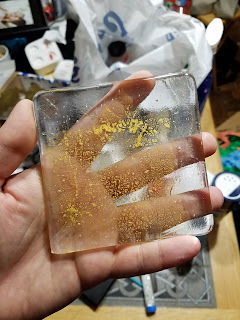 Making Roman Gold, as Rhode is trying, or Byzantine Tesserae as I am, costs a bit! The leaf is not terribly cheap, though you can find it reasonably. She speculates gold foil, not leaf, would work better but it runs $75/5 sheets. Don't use imitation gold. I did this before a year or two ago, without entirely realizing. It was an aluminum-based product, I believe. It turned horrible colors and crinkled up under the glass. 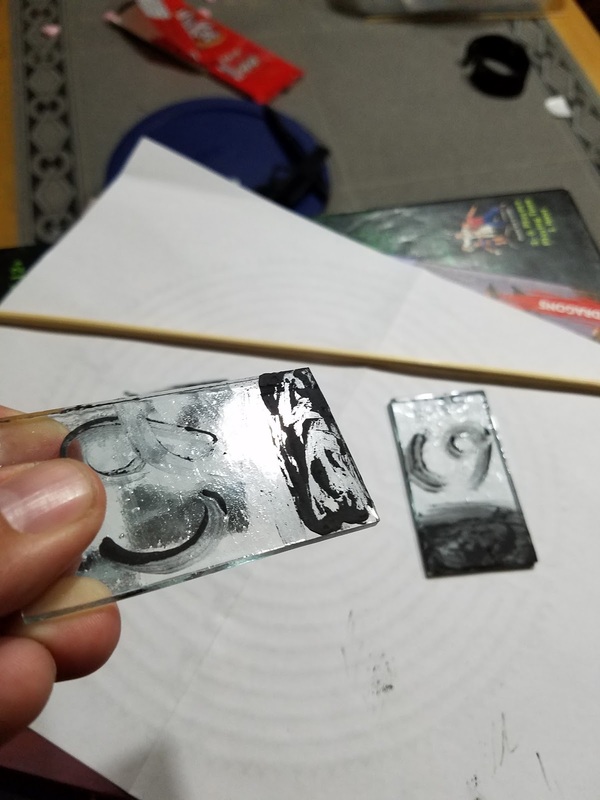 I wondered at using silver to do this. 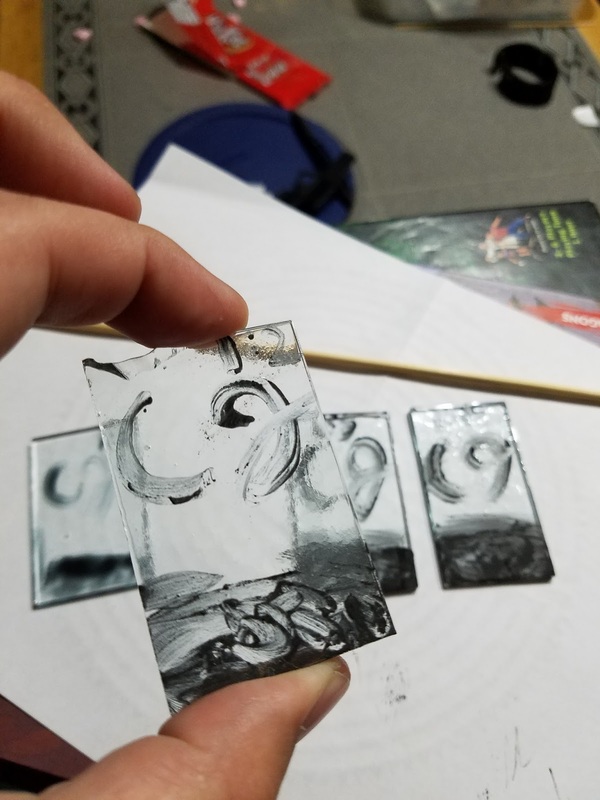 I'm told it can work, but my experience with silver stain says it certainly cannot. 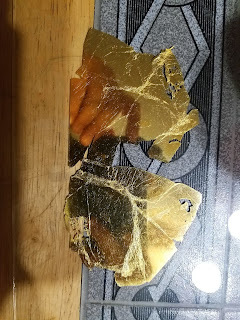 Ken Leap's book shows an example of firing a piece of solid leaf, and it made a dark amber stain at just slightly higher temperatures than I use to fuse. 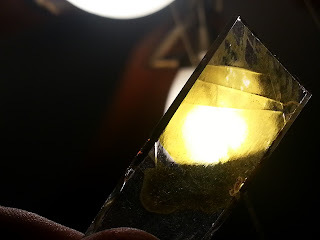 Further, I've used ground silver leaf in a period formula at much lower temperatures, and it made a light lemon yellow. I'd think 'silver' would necessarily be platinum leaf, which I have not priced or looked at. Phase 2 has actually turned up some successful blends! Detailed below are tests I ran with pure silver, silver nitrate, copper sulfate, and silver sulfate as the active compounds. Binders included a new, "brand name" red ochre, yellow ochre, gum arabic, and brick dust. After doing a round of tests I came up with several new ideas, particularly where pure silver and copper sulfate are used, and had to do another set. Silver dust and gum arabic - Almost indistinguishable from pure silver dust. Film formed, gum arabic undoubtedly. Weird to see it plainly, but interesting to get a clear visual of the effects of gum arabic. 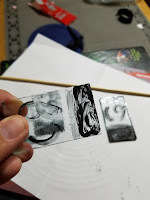 I've noticed recently, when I added too much water to some matting paint, how there is a "thickness" to the water, as you stir the paint you can see some of the unmixed water jiggle and repel the paint until you force it to mix. 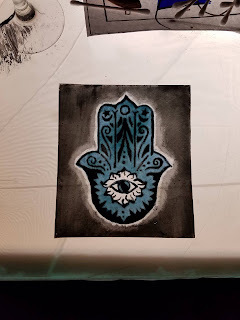 I've not tried mixing paint with no gum arabic but I think I'll try it to confirm my thought that that is also the GA (rather than the paint). That may be what they refer to as "body" when talking about other binders mixed with water. Brick dust - Probably needs to be even finer. Works well. I ground pot shards with a pestle and mortar, but I think I need to get it even finer. I'd love to get my hands on a ball mill to do this, but it's not in any shape period. On two slides it's almost imperceptible (this picture above is not a very good example, but it shows up at least) but it was actually there. 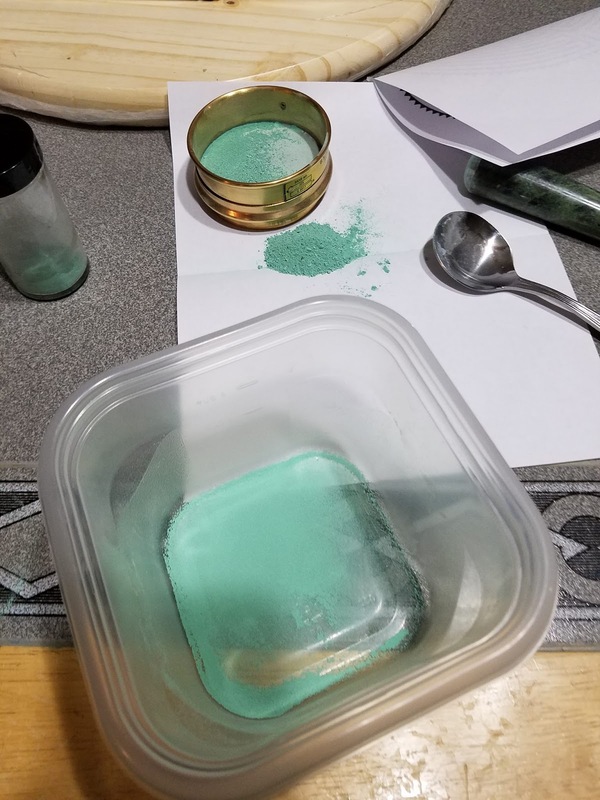 Because of this realization I tried a stronger mix of copper sulfate for this round. As detailed below in Sample 6 it didn't work out, but I have a good idea why not (temperature). Sample 1 - Pure silver dust and gum arabic (1:6). Oddly enough, this did nothing. I suspect it takes a higher temperature to work. 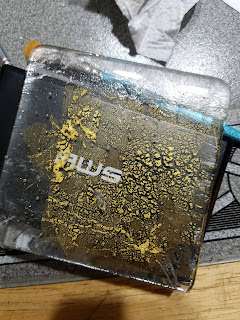 I know from Leap's book that pure silver leaf will leave a dark amber stain on glass, I can't imagine the powder not having the same effect. Later review of Leap's book indicated he fired his pure-silver tests at 1500°, a full 500° hotter than I did. I know what to try next, and may throw some more of sample 6 in with it. 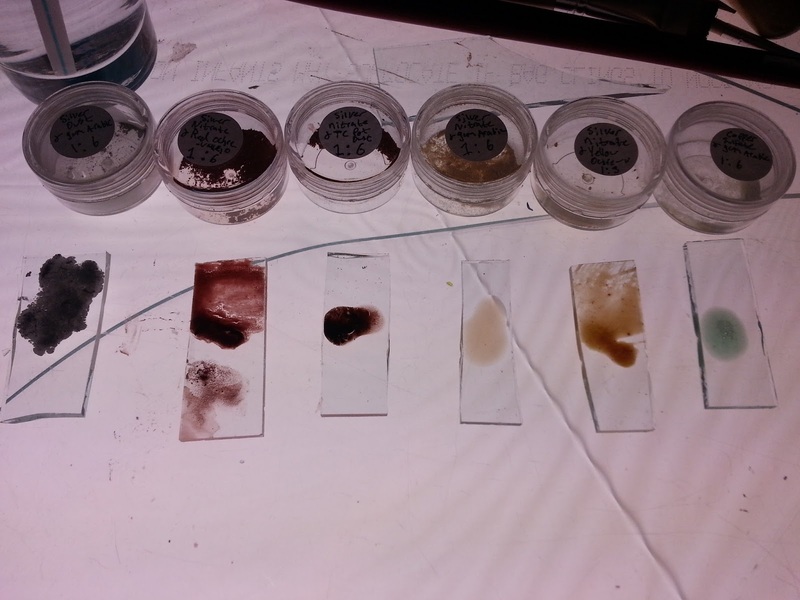 Sample 2 - Silver nitrate and red ochre (this time from Vallejo pigments). Clear proof that there was an issue with the red ochre I bought before, this name brand sample didn't have the same hazy effect that the first sample left behind, ruining what results there might have been. Part of the sample is a little darker, but I suspect that may be related to how I used it (no blending, possibly imperfectly even surface allowing oxygen to get in, etc) rather than the mix. I consider this one a success! 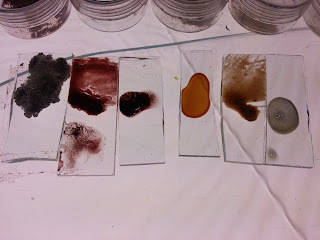 Sample 3 - Silver nitrate and terracotta dust. A bit of research indicated most of the bricks before the 14th century would have been very similar to what we call terracotta. I bought a small planting pot, smashed it, and started grinding it into a powder. It seems to work quite well, actually. The one downside was that it must be ground very finely. Small "pinholes" are visible in the sample (close-up later in the post). 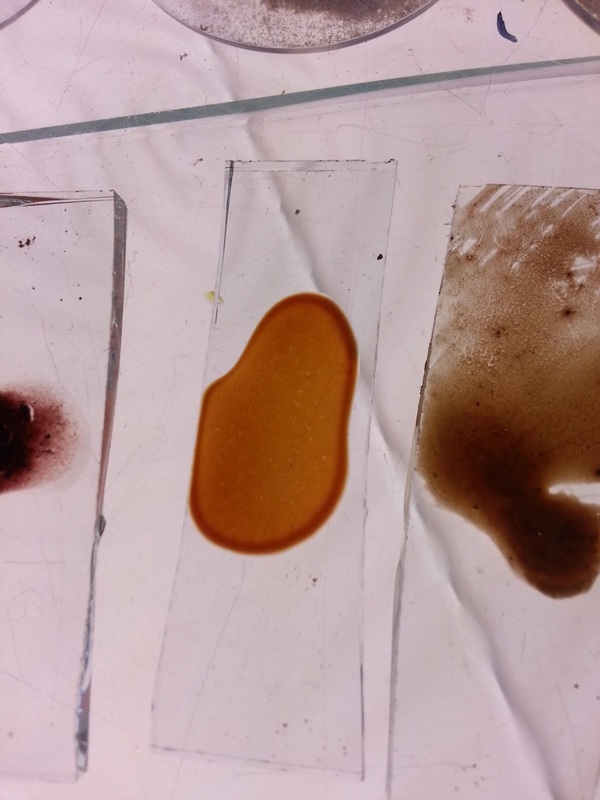 This was caused by less well ground (larger) bits of the terracotta that inhibited the even spread of the silver nitrate. This also left behind a bit of hazing on the edge, but I again suspect it has to do with handling rather than the compound. I also consider this one a success. Sample 4 - Silver nitrate and gum arabic. Oddly, this didn't work at all. No effect was left behind. Isenberg's book has a chapter on painting and a page on silver stain. It mentions that the "Reddish material" has minerals which pull the sodium out of the glass and allow the silver in. I find it hard to believe, but at the moment have no other explanation for this chip's complete lack of stain. 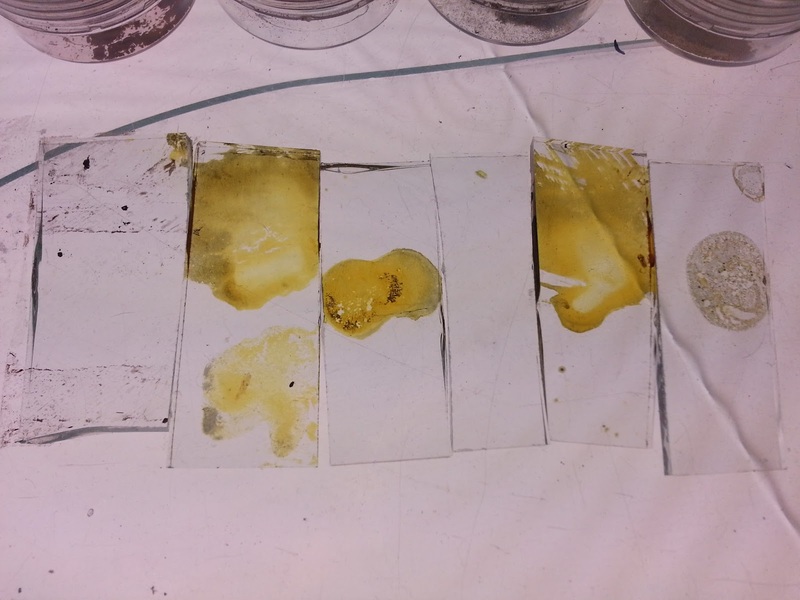 The silver sulfate and copper sulfate chips, both mixed with gum arabic, had visible staining. Silver nitrate did not. The same book also states that "other silver salts" (presumably silver sulfate) are added to stain powders because nitrate is unpredictable and melts unevenly. I haven't seen that to be the case, yet, either. Sample 5 - Silver nitrate and yellow ochre (vallejo). This mixture was twice as strong as the same combination I tested in "phase 1" and likewise is a much stronger color. This is 1 part silver nitrate to 3 parts ochre. 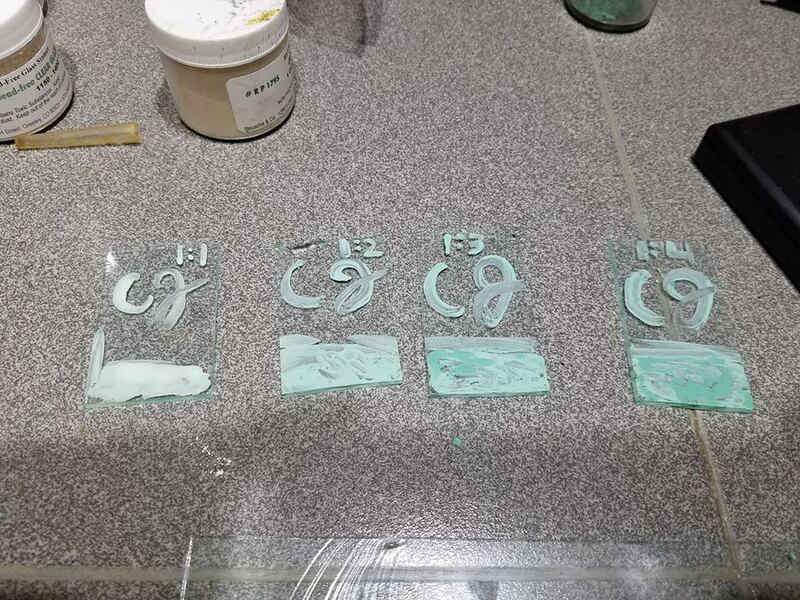 Sample 6 - Copper sulfate and gum arabic - This is a 1:6 strength mixture, better than what I had previously made. 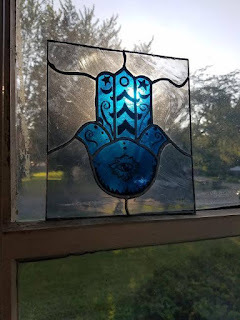 I discovered, just before pitching the last test chip, that copper sulfate actually had stained the glass. 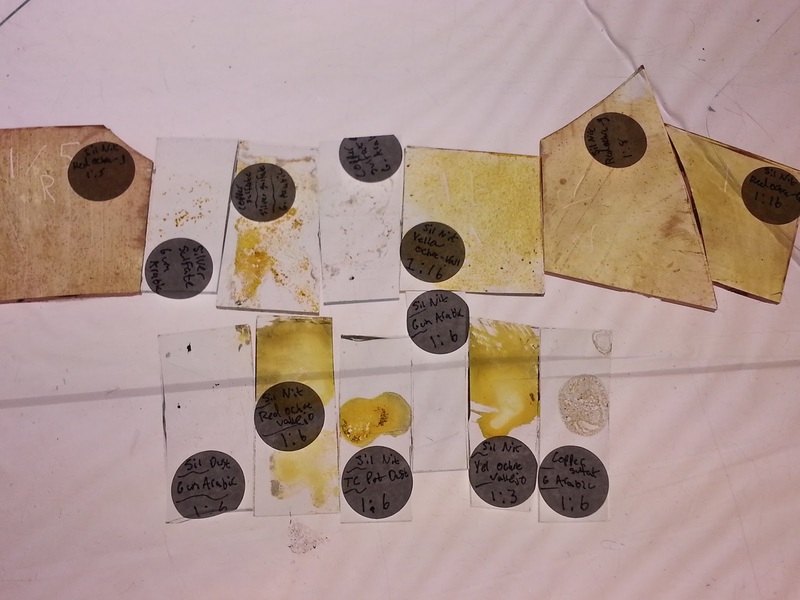 The compound was in such a small quantity that it was in the form of tiny specks. I mixed this more strongly and used more of it to try and get a more visible effect. I didn't get it, though again I got visible effects. I think this merits a higher temperature or longer soaking period.